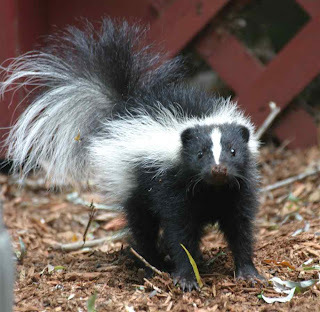 A skunk is one animal that makes us all run the other way! It can spray up to 10 feet with accuracy, and the mist reaches up to 15 feet. No one wants to encounter the tail of a skunk! The odor can travel up to 2 miles, so when you smell that lovely smell, it could mean the skunk is a safe distance away, or right around the corner! We might manage to avoid them ourselves, but sometimes our dogs don’t have the same luck. I had a friend when I was a teenager whose house dog was sprayed by a skunk. The family did their best to clean him off, but he still managed to get the smell in their house. When my friend came over to my house, her things smelled like a skunk, and we had to keep them outside our door. This was such a trial for this family as they tried to smell normal again! How do you get the smell out? There’s the old saying of using tomatoes – but I’ve heard that just doesn’t quite do the job. I ran across this recipe from The Prairie Homestead. She has personally used this recipe with success! Put on your gloves and gather everything you will need. Once you mix the ingredients, the solution must be used immediately, so there won’t be any time to go searching for the dog, etc! I did this outside and tied the dog up to a post so my hands would be free. I also had a hose handy. I suppose you could do this in your bathtub if you had to, but I wouldn’t unless I was very desperate! Mix together the peroxide, baking soda, and dish soap. Stir well and then quickly apply to the dry dog, being careful not to splash any in his eyes. Thoroughly work the solution in his coat. It should cover and permeate as much of the hair as possible. Allow the dog to “soak” for around 5 minutes. A chemical reaction is occurring which actually neutralizes the odor. This is why you must use it before the peroxide and soda are finished with their reaction. It can not be made ahead of time and stored. After the waiting period, thoroughly rinse the dog with water. You may have to repeat the process, but I only had to do it once and we were skunk free! *I hope none of us need this recipe in the future, but I’m glad I have it on hand just in case! I used this remedy as well as others even got my puppy groomed and he still smells along with my home.